Precious metals advanced Friday, mostly modestly. Gold’s increase was its first in three days but, like for silver, the yellow metal still logged a second straight weekly decline. Gold for June delivery climbed $1.30, or 0.1%, to settle at $1,295.60 an ounce on the Comex division of the New York Mercantile Exchange. 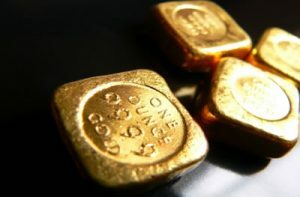 Gains in gold were limited, opined analysts, as the U.S. employment report for March showed a stronger-than-expected increase of 196,000 jobs. "It’s quite a good number… and basically means the U.S. economy is doing fairly well and the growth will accelerate after a slowdown in the first quarter," Reuters quoted SP Angel analyst Sergey Raevskiy. "It’s all good for the economy and equities, but not for gold." "Thirteen market professionals took part in the Wall Street survey. Seven participants, or 54%, described themselves as bullish for the week ahead. There were three voters each, or 23%, for both bearish and sideways. Meanwhile, 534 respondents took part in an online Main Street poll. A total of 239 voters, or 45%, called for gold to rise. Another 191, or 36%, predicted gold would fall. The remaining 104 voters, or 19%, saw a sideways market." Elsewhere, silver for May delivery edged up less than a half cent to close at $15.086 an ounce. Silver futures also dipped 0.2% on the week. They dropped 1.9% last week. The precious metal is 2.9% lower on the year so far. July platinum added 90 cents, or 0.1%, to settle at $905.40 an ounce, for a 6% weekly increase. Palladium for June delivery rose $13.60, or 1%, to $1,345.90 an ounce, for a 0.3% advance on the week. Both are sharply higher on the year with gains of 13.1% for platinum and 12.4% for palladium. Gold added $5.30, or 0.4%, to $1,288.45 an ounce. Silver rose 11 cents, or 0.7%, to $15.195 an ounce. Platinum gained $21, or 2.4%, to $903 an ounce. Palladium fell $15, or 1.1%, to $1,352 an ounce. In LBMA results for the week, silver rose 0.6% and platinum soared 6.2% while gold shed 0.5% and platinum dropped 2.7%. Gold bullion coins moved up by 6,000 ounces after rising by 1,500 ounces last week. Last week, American Gold Eagles accounted for all sales. Splits this week included 3,000 ounces in American Gold Eagles and 3,000 ounces in American Gold Buffalos. American Silver Eagles improved by 550,000. They logged no gains last week. American Platinum Eagles rose by 1,100 ounces after climbing by 1,000 ounces last week.